Descended from the primitive dogs of the ancient people of Japan, the Shiba Inu was bred to hunt small wild game, boar and bear. 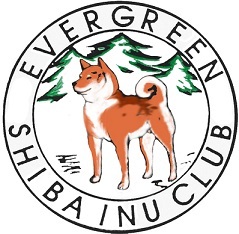 The name Shiba in Japanese means brushwood, after the breed's hunting terrain or the color of brushwood leaves in the fall and Inu means dog. World War II nearly spelleddisaster for the Shiba due to bombing raids and distemper, but after the war, bloodlines were combined to produce the breed as it is known today. Neck is thick, sturdy, and of moderate length. Topline is straight and level to the base of the tail. Bodyis dry and well muscled without the appearance of sluggishness or coarseness. Forechest is well developed. Chest depth measured from the withers to the lowest point of the sternum is one-half or slightly less than the total height from withers to ground. Ribs are moderately sprung. Abdomen is firm and well tucked-up. Back is firm. Loins are strong. Tail is thick and powerful and is carried over the back in a sickle or curled position. A loose single curl or sickle tail pointing vigorously toward the neck and nearly parallel to the back is preferred. A double curl or sickle tail pointing upward is acceptable. In length the tail reaches nearly to the hock joint when extended. Tail is set high. Coat color is as specified herein, with the three allowed colors given equal consideration. All colors are clear and intense. The undercoat is cream, buff or gray. Urajiro (cream to white ventral color) is required in the following areas on all coat colors: on the sides of the muzzle, on the cheeks, inside the ears, on the underjaw and upper throat inside of legs, on the abdomen, around the vent and the ventral side of the tail. On reds: commonly on the throat, forechest, and chest. On blacks and sesames: commonly as a triangular mark on both sides of the forechest. White spots above the eyes permitted on all colors but not required. Bright orange-red with urajiro lending a foxlike appearance to dogs of this color. Clear red preferred but a very slight dash of black tipping is permitted on the back and tail.Black with tan points and urajiro. Black hairs have a brownish cast, not blue. The undercoat is buff or gray. The borderline between black and tan areas is clearly defined. Tan points are located as follows: two oval spots over the eyes: on the sides of the muzzle between the black bridge of the muzzle and the white cheeks; on the outside of the forelegs from the carpus, or a little above, downward to the toes; on the outside of the hind legs down the front of the stifle broadening from hock joint to toes, but not completely eliminating black from rear of pasterns. Black penciling on toes permitted. Tan hairs may also be found on the inside of the ear and on the underside of the tail. Sesame (black-tipped hairs on a rich red background) with urajiro. Tipping is light and even on the body and head with no concentration of black in any area. Sesame areas appear at least one-half red. Sesame may end in a widow's peak on the forehead, leaving the bridge and sides of the muzzle red. Eye spots and lower legs are also red. Clearly delineated white markings are permitted but not required on the tip of the tail and in the form of socks on the forelegs to the elbow joint, hind legs to the knee joint. A patch of blaze is permitted on the throat, forechest, or chest in addition to urajiro. Serious fault--Cream, white pinto, or any other color or marking not specified is a very serious fault and must be penalized.